PED-LOCK Flareless bite type fittings have a unique three-piece design, with a body, a special case hardened ferrule and a nut. 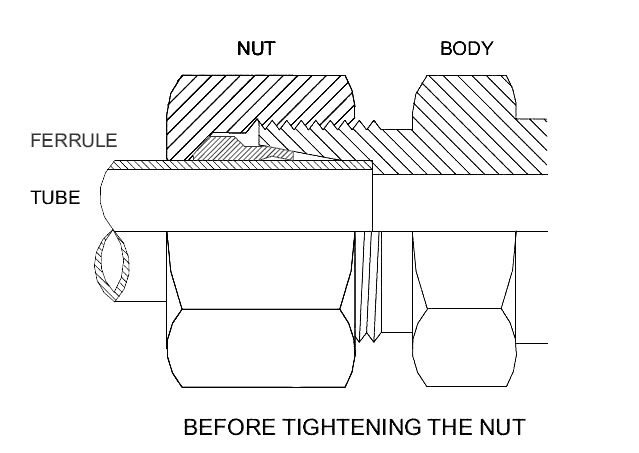 Unlike in ordinary compression joints, when the nut is screwed on to the body, the ferrule grips the pipe in position and perceptibly bites in the pipe surface to provide a positive seal. When tightened fully the case hardened ferrule is bowed slightly in the middle and acts as a spring. This spring action of the ferrule maintains a continuous tension between the body and nut and prevents the nut from loosening under vibration and strain. This unique function of ferrule is a result of careful selection of right materials, precision machining, and case-hardening to give it a hard exterior and a soft core. The ferrule thus not only bites into the pipe readily and superficially without causing surface cracks, but also maintains its spring action for repeated use without loss of strength and sealing qualities. It is absolutely essential that the pipe should be held firmly against the stop in the inner cone of the fitting otherwise the biting process cannot take place satisfactorily.